Might want to consider some isolation stands/pads for the speakers. Generally you don't want speakers to be resting on the same surface that your TT is on. Loving my 20s on my turntable sounds great.. Still, you may want something to decouple the S20 speakers from the surface like these or these. We all hear things differently and your opinion as to what you heard is valid. However, I would agree with @DSkip on this as I believe that the S60 puts out more bass and a wider spectrum of sound compared to that of the S55. Everyone's ears are different..I had the 60s in my living room same spot my 55s are.. Planned on using the 55s for rears I talked about doing this earlier in this thread.. After a week I returned the 60s as they where not worth the extra cash.. They had a little more punch I would say but just didn't make that much difference.. Now that being said I have a small room.. Maby a bigger room speakers wider apart someone will see a big difference wider Soundstage.. As for the guy asking in a smaller condo that's my opinion.. Interesting. What are you powering with (sorry if you oh alreaud stated)? My experience, S60's driven with my the Halo A23 (125w) Meh. Same speaker driven with the Anthem 225 integrated (225W).....Yeah. I am sure it all comes down to the difference in Amperage between the 2 amps. Just a standard avr 90per.. The 55s don't need more.. Maybe the 60s do I don't really know.. Thanks for the advice I ordered the Adam hall will see if it makes a difference..
You weren't waking them up to hear the difference. Got rid of my amp after I got rid of the power hungry a9s.. Put it on the 55s and was no need for it..
Having different speakers in the same spot and expecting different results may also have been an issue. Speaker placement is a critical step in getting the most out of a pair of speakers as this determines how the speakers interact with your room's acoustic properties. There are a lot of issues that could have happened. I tried both on a ton of gear over a year and can say that while the S55 is good, the S60 is definitely worth the bump in price. My living room, where the S60 resided, is 14' x 18' x 14' - a very large space. The S60 did an excellent job on a few integrateds as well as the Pioneer SC-35, SC-63, and SC-99. Not only did it provide more bass, but it also did so with more ease to the presentation. In many cases there is a middle-tier product in a series that is the gem - look at the RT55 or Monitor 7. In this case, the TOTL is the gem in the Signature series and its not a contest IMO. I don't need to look at anything further I love my speakers.. I have gotten bashed because people think I'm crazy I like these over my a9s or the 60s as a matter of fact..
Just because there is a disagreement doesn't mean you were bashed. I'm happy that you are happy with the S55 but that wasn't the point of our discussion - it was which one puts out enough bass to not need a sub. The S55 are great speakers too. Nope. No bashing on my part. More like a difference in my findings compared to yours. As I said initially, we all hear things differently and that is perfectly fine. If you’re happy with the sound you’re getting from the S55’s then that’s cool. I still prefer the S60’s and I’ll say that to anyone who asks because that’s been my experience. No not anyone here man.. Just in general on different boards.. If people are bashing you on other boards, then people are dismissing Polk before they give them a chance. I've played around with, owned, and heard much gear that most people will never have the finances to chase. I've heard what these pieces offer, and I can still come back to a series like the Polk Signatures and tell you they are damn good speakers at that price point and beating them will mostly come down to listeners preference instead of outright performance. They'll never be giant killers, but then again, giant killers in this industry are a unicorn. Keep your chin up. You made a good investment. Here is how good the Signature line is. Had a family get together this afternoon. My uncle a retired Navy Captain was here. We had on Harry Potter on for the kids. My uncle was saying how he likes the sound of my system. Once the movie was over I put on some Simon and Garfunkel. he got a glass of wine and sat back, my other uncle and one aunt joined him. About a 1/2 hour later he asked how much were the speakers. He said I had to pay at least $2k for them. I told him about the Adorama deal I got. I then gave him a good demo or the S20 in the bedroom, once again he was impressed. He said when he gets back home he will be looking for a pair. These Signatures are a darn good speaker that continues to impress. Many thanks to all of you for your insight . I do live in an older condo ( built in the 70s lol) so I assume its well-insulated ( it survived hurricane Irma..so thats sayin’ something Imo ). I saw a really good price on the S55s ( a little over 200 each ) from a reputable online retailer that I’ve purchased items from the past...so I bit the bullet and ordered a pair...couldn’t pass on it. If worse comes to worse, I got 60 days to return if they are not to my liking. Congrats, I look forward to reading your impressions. A few suggestions. Pull the bookcases out from the wall as far as you can without it looking stupid. Then pull the speakers as close to the front edge as possible. Toe in the speakers so you can just see the inside panel from your seat. This is a must do, isolate the speakers from the bookcases. Something as simple and cheap as 1/2" rubber bumpers will work. Thanks I orders some foam things for them to sit on and try be here today..
cant decide want to see what you all ado. I don't use a receiver but I think you can get something lower in the SIgnature line if you are incorporating subwoofers. In this way, the "main" speakers are only producing frequencies above 60Hz or 80Hz, depending on where you set the crossover in your AVR. For example, I used bookshelf speakers in my HT setup for many years as they were paired with an SVS subwoofer. The SVS handled all the bass and low mid-bass while the bookshelf speakers provided the mid-bass and treble. The pairing was brilliant and fairly inexpensive, all things considered. You may need speaker stands for the bookshelf speakers, which will add to the cost. So, whichever speakers will cost the least (floorstanding Signature series like the S50) or bookshelf speakers + speakers stands (like the S15 or S20 + stands) is the way I would go. Hope that helps as any AVR should do a decent job of driving these speakers, especially if the heavy lifting is handled by a powered sub or two powered subs. Is your main interest watching movies & TV or listening to music? What's the ratio? If you have space, I prefer the S30 slightly. The S35 is a great speaker and I'd be more inclined to used them as surrounds and mount them on walls vertically than use one of the bookshelves. The S20 is a large speaker. I like the look of it a lot, that was my main reason and i thought since they have all this drivers they would outperform the s30 i guess i could be wrong. if not for space or look is the s30 better then the s35 as a center channel? I have not owned them but did hear them in a shop room.. I don't think they sound much different for the highs.. But they definitely outshined with lows even though the center speaker is mainly dialogue I still prefer it..
More power is always better I'd go with the RX-A10XX series AVR. It will allow you to expand latter on. Or you can look into Marantz SR60XX or Denon AVR-X3300 and up series. 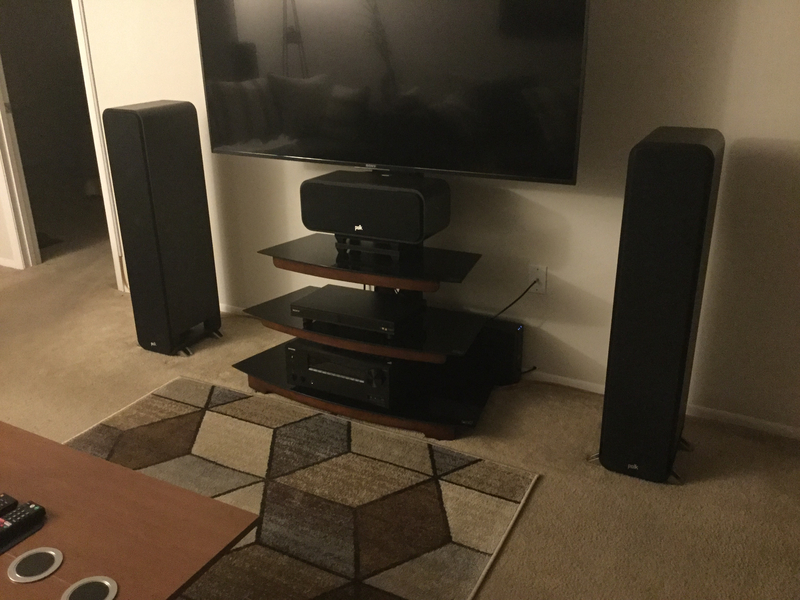 S30 is a very good center speaker, I liked mine but my TV stand was made for the bigger CSi5/CSiA6 speaker. Skip is right on about the S20 being BIG. I use mine as main speakers in the bedroom setup. I do think they are too big for surrounds. I would look at S10 or S15. 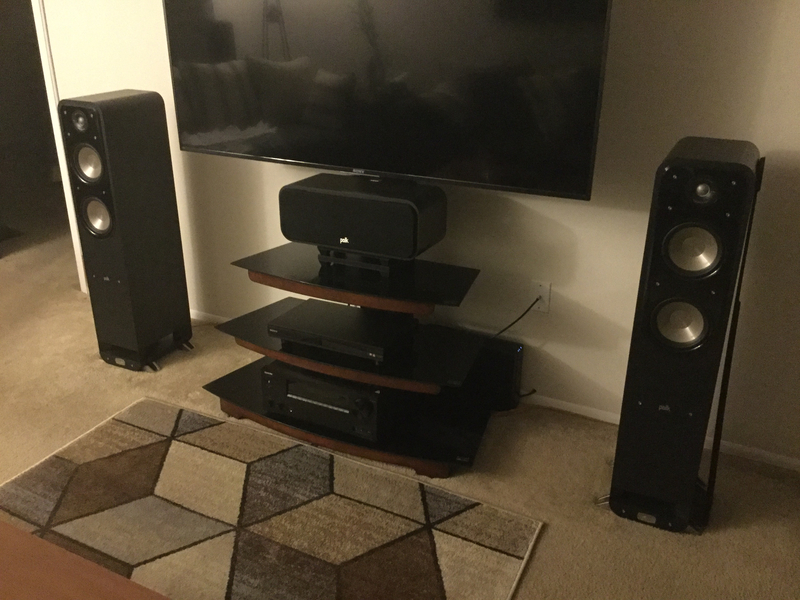 If budget allows two S35 would make a good surround. Hell the s15 is pretty big if you don't have a huge living room.. Mine look like tanks hanging on the wall..